Hugh Brown Collins employed William Leiper (1839–1916) to design Auchenbothie House in 1898, and acted as his own architect in 1903 for a modest extension to one of the cottages on the estate. 1 It is therefore surprising that he turned to Honeyman, Keppie & Mackintosh for the design of the gate lodge. Leiper's Auchenbothie House is a Franco-Scottish Baronial mansion, with roughcast walls and decorative red sandstone dressings, to which the lodge stands in complete contrast. Mackintosh proposed three alternatives before the executed design was settled upon. All of these earlier designs were of two storeys, and all were small-scale variations on the harled vernacular manner of Windyhill. In one, the lodge straddles the drive, pierced by a carriage arch. 2 In another, it is tied into the entrance wall of the estate, which has an undulating coping like the garden wall of Windyhill. 3 In the third, it is detached, with a distinctive round stair tower tucked into the re-entrant angle of its two wings. 4 In their roughcast walls, small, irregularly positioned windows, steeply pitched roofs and sloping buttresses, they deploy some of the same basic ingredients as the executed design, but they show more inventiveness and individuality. All three proposals were considerably more ambitious than the very plain, single-storey cube that was eventually built, and they were perhaps rejected by the client on grounds of cost. The lodge stands in its own garden, separated from the road by a low boundary wall (largely rebuilt c. 1991). 5 Almost square in plan, its roughcast stone walls have no projections except for a sloping buttress between the windows of the W. front. The slated, hipped roof is almost a pyramid, with a single chimney stack just off-centre, and the deep-set windows sit immediately below the eaves. On the drawings approved by the County authority, Mackintosh specified Aberfoyle grey slates for the roof and steel casements by Henry Hope & Son for the windows. The present (2010) leaded glazing in small diamond panes appears to be a late 20th-century replacement. Apart from this, the plan of 1901–2 survives: four interconnected rooms – originally kitchen, wash-house and two bedrooms – radiate from the central chimney stack, with a bathroom in the S.E. corner. There were fireplaces in the two bedrooms, a range in the kitchen, and a boiler in the wash-house. The ceilings follow the slope of the roof for about half its height before becoming horizontal, making the interior surprisingly lofty. The drawings show a louvred projection in the wash-house roof, presumably for drying clothes: it does not survive, but a photograph taken c. 1976 shows that it still existed at that date. 7 The wash-house contains what was originally the back door, which now serves as the only entrance. 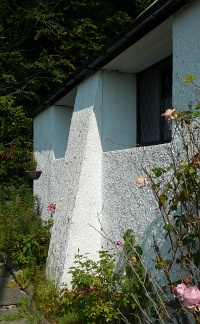 The unmoulded, sloping buttress and the use of roughcast show the influence of C. F. A. Voysey (1857–1941). The year after Mackintosh designed Auchenbothie gate lodge, Voysey designed a similar square, pyramid-roofed lodge for the house called Vodin at Pyrford Common, Surrey. 8 An even closer parallel is with a 1903 design by C. R. Ashbee (1863–1942) for Little Coppice at Iver Heath, Buckinghamshire. 9 A more elaborate precedent for the basic form of all these houses is the lodge of 1866 designed by William Eden Nesfield (1835–88) for Kew Gardens, Surrey. 1: Dictionary of Scottish Architects, 1840–1980, www.scottisharchitects.org.uk [accessed 7 December 2010]; University of Glasgow Library, Special Collections: plans for proposed rebuilding of Cloak Cottage, MS Hislop 289/1. 2: The Hunterian, University of Glasgow: GLAHA 41858 (M199-005). 3: The Hunterian, University of Glasgow: GLAHA 41859 (M199-006). 4: The Hunterian, University of Glasgow: GLAHA 41860 (M199-007). 5: The Hunterian, University of Glasgow: copy of report of site inspection by Scottish Office inspector, 30 July 1991. 6: The Hunterian, University of Glasgow: copy of report of site inspection by Scottish Office inspector, 30 July 1991. 7: Alison Harris, A Report on the Present and Future Condition of the Remaining Buildings of Charles Rennie Mackintosh, Dip.Arch. dissertation, Glasgow School of Art, 1976. 8: British Architect, 69, 20 March 1908, p. 205. 9: Alan Crawford, C. R. Ashbee, New Haven, London: 1985, p. 270. 10: A copy of the report (MBS28) is held by the Charles Rennie Mackintosh Society, Mackintosh Queen's Cross, 870 Garscube Road, Glasgow G20 7EL. The Mackintosh Buildings Survey was funded by The Monument Trust.